We researched many different ball mounts and compared them for strength, construction, brand reputation, weld quality and more and have determined that the CURT 45036 Loaded Ball Mount is our best overall pick. We have also listed two other ball mounts that topped the list as well. In addition to these three reviews to introduce you to three high quality ball mounts, we have put together a buying guide that will help you understand everything you need to know about ball mounts. This information will help you choose the right one from all of the different choices you have available to you. Any time you tow a trailer you need a tow hitch that will be attached to your vehicle and you need a ball mount as well to attach the trailer to your vehicle. Other names for the ball mount include hitch ball mount or trailer ball mount. You may think that all ball mounts are made the same and you can just go and pick any of them but this is not true. Once you have purchased a tow hitch you will need to purchase the right ball mount to go with it. The ball mount you choose will need to have the proper shank size that matches the receiver of the hitch. It will also need to have the appropriate weight ratings that exceed or at the very least, meet the gross weight of the trailer. It will also need to have a drop or rise to ensure the trailer is level. There are a lot of things to consider when purchasing a ball mount for the vehicle you will be towing with. Ball mounts come in many different sizes. There are other features to look at as well such as vehicle compatibility, weight capacity, type, and so on. If you are not familiar with ball mounts this article will come in handy because you will learn what you need to look for, what kind of ball mounts there are, and how to size them properly with your tow hitch. The reviews below will give you more insight into the three top rated ball mounts on the market. 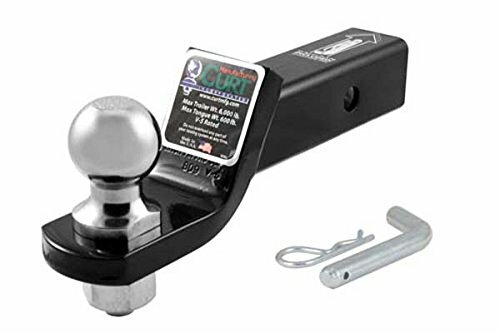 A ball mount from CURT provides you with all the necessary things you need and come pre-fitted with a trailer ball that has been factory torqued. This eliminates you have to mount the ball yourself and torque it. You can use a ball mount right out of the package and tow right away. Each CURT ball mount comes with a clip and pin to mount it into the receiver tube that is the appropriate size. There are a variety of weight ratings and sizes available. This loaded ball mount has a gross trailer weight of 7500 pounds and a tongue weight of 750 pounds. The 2” trailer ball is the perfect size for towing campers, utility trailers, livestock trailers, recreational vehicle trailers, and boat trailers. The ball mount measures 8 ¼” and has a black powder finish that resists chipping, rust, and damage from UV rays. It also has a drop of 2”. All of the loaded ball mounts by CURT have 2 x 2 inch shanks and are made with superior quality that you will see with all of their products. If you tow heavy loads on a regular bas you need a ball mount that you can rely on. The Connor Tri Ball hitch and hook is just what you need. It is designed to handle heavy-duty requirements so it can be used with all 2” towing hitches and 2 x 2 inch receivers. It has high compatibility with many vehicles and trailers making it a very versatile choice. The gross trailer weight of this ball mount is 10,000 pounds with a tongue weight of 1000 pounds. The heavy duty steel used in construction has a black powder coat finish that protects it against rust, scratches, and corrosion that can occur with daily use. 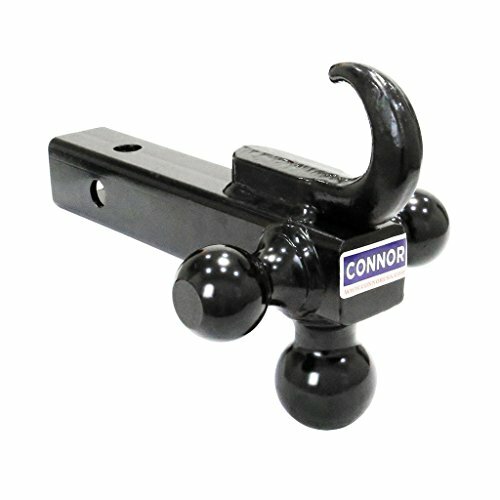 The Connor Tri Ball Hitch meets all SAE J-684 regulations for even more safety and peace of mind while towing. The 99.9% precise robotic welds are long lasting and reliable. Along with the tri ball mount, consumers get a lifetime warranty as well. This versatile double ball mount by B&W can be adjusted to multiple heights, eliminating the need for several different ball mounts. 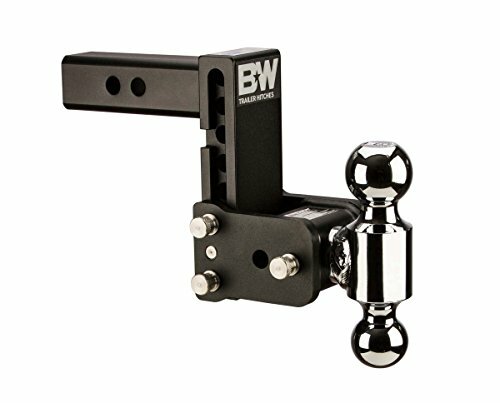 When not using it for towing, the B&W ball mount can be stowed underneath the vehicle so you don’t have to keep installing it and it stays out of the way. This ball mount fits regular 2” receivers and has a drop of 5” and a rise of 5 ½”. One of the balls measures 2” and the other is 2 – 5/16”. This product has a 1000 tongue weight rating and a gross trailer weight of 10,000 pounds. Changing from one ball size to the other is very easy. The black powder coating covers a zinc phosphate base to ensure that it is long lasting and makes it resistant to rust, scratches, and corrosion so it is durable too. It is the perfect choice for your towing needs and works for towing all kinds of things from horse trailers to boats. Whenever you tow anything there are certain things you must have and a ball mount is one of them. This is part of the whole towing assembly that is required to successfully and safely tow many different things thanks to the variety of ball mounts on the market. These important pieces of the towing assembly are long lasting and made to be durable as well as to handle many different weights. With so many ball mounts on the market it may become confusing to decide which one is the right one for your towing jobs. Below we have supplied you with a buying guide that will help you navigate the different ball mounts so you understand the differences and how to sort through them to get to the one that will meet your needs. We spent time comparing many different ball mounts for durability, versatility, price, weight ratings and much more so you would not have to do all this yourself. The reviews we provided of three top rated ball mounts gives insight to three excellent quality choices that may be perfect for your needs. They are strong, durable, versatile and from excellent companies that are known for quality. If you are interested in looking around more before you purchase, take a look at these other ball mounts that we have listed below. What is a Ball Mount? A ball mount is used to raise or lower the ball hitch so the trailer and the vehicle towing it are level. If the tongue of the trailer rides below or above level can cause shifts in the load, stress on the suspension, tire failure, uneven tire wear, and poor handling. It is especially important that the tongue height is correct when towing tandem-axel trailers. If the axel is uneven it can cause dangerous stress on the tires, axles, and wheel bearings. The way that you choose the right ball mount is to match it to the receiver tube’s diameter. It will also have a hole that will match the ball shank. To ensure that you have the correct towing height you will need to measure the trailer tongue on a level surface from the ground up to the bottom of the coupler. Next, measure the height of the receiver from the ground to the top of the opening of the receiver. Subject the two measurements and this difference gives you a good idea of whether the ball mount requires a drop or rise. One of the great things about a ball mount is that it is designed to handle a needed drop or rise by being reversible. Other choices include a hitch bar or a ball mount system that has a selection of ball sizes and the drop or rise can be adjusted by removing a few pins. The purpose of this ball mount is to make is possible for the trailer to turn as your vehicle does without causing problems. The benefit to a ball mount is that you can choose different sizes that will work with different trailer couplers so you are not limited on what you can tow as long as you stay within the gross weight range and tongue weight range. Most trailer ball mounts are compatible with a variety of sizes so you don’t have to get a new ball mount each time you want to tow something different. Whichever ball mount you choose to purchase, make sure that you have stayed within the weight capacity limits for the trailer and the tongue. Safety is the main thing to focus on with any trailer you choose to tow. Choosing the right ball mount is the first step in achieving that. There are several different kinds of ball mounts on the market. All of them are separated into classes based on the weight capabilities they have. There are two important weight ratings that you will be looking at: tongue weight (TW) and gross trailer weight (GTW). The gross trailer weight is the total weight of the trailer and the load the trailer is carrying. The tongue weight is determined by the weight at the point where the hitch and the mount are connected. There are five different weight classes available to choose from. Each class has a different GTW and TW. It is always better to choose a weight rating that is higher than you think you will need. Make sure that you have checked the vehicle’s weight rating as well. We have listed the different types of ball mounts below. Multi-ball – A multi-ball mount has three or four balls on it that can be switched easily to accommodate different sized couplers. Self- aligning – A self-aligning ball mount forms a V that will help line up the towing system. Dual-ball – This is another multi-ball mount that only features two different-sized balls. Cushioned – A cushioned ball mount absorbs shock so the load of the trailer doesn’t cause problems with the drive train while you are braking or driving at higher speeds. Triple Ball with hook – This ball mount has a couple of different sized balls and a hook as well to connect with specific types of trailer couplers. Integral – This one piece mount does not have an opening that will hold other balls since the one integral ball is already there. There are many things you need to consider when shopping for the correct ball mount. We have listed these considerations below. Towing Capacity – This is very important to know since you do not want to choose a ball mount with a class that is less than what you need. Having more towing capacity than you need is not going to affect handling or hurt the vehicle or trailer but choosing a weight class that is too low can cause those problems. Towing System Requirements – You want to ensure that the towing system does not have a higher rating than the maximum ball mount rating. In general you want the shank diameter of the ball hitch and the hole of the mount need to match. In addition match the diameter of the trailer couple and hitch ball to make sure they have the same measurement. Type of Vehicle – Ball mounts typically have the types of vehicles they work well with. To ensure that the ball mount you want is compatible with the type of vehicle you have check the website of the company or the manual for that car. Trailer Weight – The weight of the trailer you are towing plays a large part in the different classes of ball mounts. You have to know the trailer’s weight to properly determine which ball mount will be best suited for the towing jobs you will be doing. Size of the Load – Another factor that is just as important as the trailer weight is the load size. The weight and type of load you are working with will dictate the strength of the ball mount as well as the type you choose so make sure you have both of these figures before you start shopping. Height of the trailer – The height of the trailer is another important piece of the puzzle that you will need to be aware of to have the safest towing experience possible. It is extremely important to keep the trailer load stable to avoid serious accidents. Measure the trailer and tow hitch to make sure they are level. This enables both the vehicle and the trailer to work together to ensure safe towing. Budget – Budget is something that you should decide before you start shopping around for your ball mount. The average cost of ball mounts can range between $20-$100 or higher depending on the size, brand, and strength of the ball mount. Cushioned style ball mounts will cost more since there are internal components that will add to the manufacturing costs. Finish – A lot of the ball mounts on the market feature a black powder coated finish that will protect them from rust, corrosion, and scratches. This finish extends the life of the ball mount and keeps it looking great even in inclement weather. The purpose of the finish is to prevent the elements from rusting the ball mount and making it useless or unsafe to use. Below is a summary of the points you need to remember when you start shopping for your ball mount. Safe towing should be your number one objective so keep all of these points in your mind as you search. 1. Have the vehicle towing limit for the vehicle you will be using for towing. You can find this in your vehicle’s owner’s manual. 2. Know the gross vehicle weight of your trailer. 4. Factor in what type of load you will be carrying. 5. Look for good, reputable brand names that have proven history for good products. The purpose of the three reviews and the buying guide that we have provided is to give you a clearer understanding of the fundamentals of how towing systems work and what the ball mounts role is in the towing system. A ball mount is critical to the towing system; you can’t tow a trailer without it. All three of the top rated ball mounts we have featured in this article are manufactured by reputable companies that focus on durability, strength, and quality with the products they manufacture. Any one of these three ball mounts would make an excellent choice for your towing needs and have a class 3 rating which means they have a GTW that ranges from no less than 7500-10,000 pounds and a tongue weight that ranges from 750 – 1000 pounds. The knowledge we have provided for you in this buying guide will help you figure out which ball mount will be the best choice for your needs based on your budget, the towing system you are using, the compatibility of the ball mount to your tow hitch and trailer, and many other factors. You will be able to read the descriptions on the different ball mounts you research and understand what the classes mean, what the sizes mean and how to safely choose the perfect ball mount for your towing needs and towing vehicle.